In Ottawa, speculation is growing about a possible spring election. When the federal campaign officially begins, religious leaders want poverty reduction to be front and centre. On Monday and Tuesday, a coalition of faith leaders met with 15 Members of Parliament in Ottawa. Their ambitious goal was to launch a national conversation about poverty. 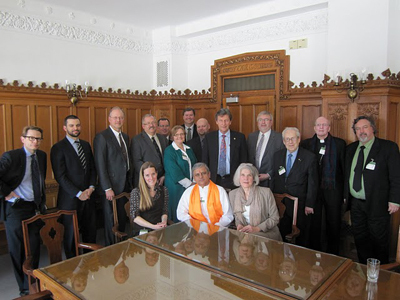 The delegates represented the Canadian Council of Churches, the Evangelical Fellowship of Canada and the Interfaith Partnership, which consists of faith-based groups that participated in the 2010 World Religions Summit in Winnipeg. Bishop Francois Lapierre from Saint-Hyacinthe, Quebec attended on behalf of the Canadian Conference of Catholic Bishops. In their joint declaration republished below, the religious leaders call on Parliament to “enact legislation to ensure federal commitment and accountability to poverty reduction goals”. The coalition says it was encouraged by the release of the Federal Poverty Reduction Plan in November, developed by a committee representing all parties. However, they express “disappointment” that the federal government “did not respond substantively” to the recommendations. The MPs who met with faith leaders included Diane Finley, Minister of Human Resources and Skills Development for the Conservative government. Liberal attendees were Glen Pearson, Michael Savage and John McKay. NDP participants were Thomas Mulcair, Libby Davies, John Rafferty, Tony Martin and Alex Atamanenko, while Johanne Deschamps represented the Bloc Québecois. Opposition leader Michael Ignatieff has agreed to meet with faith leaders on March 20th. Together as people of faith, informed by our respective traditions, and compelled by our sincerely held beliefs to care for those in need within our communities and across this nation, we recognize this time to be a unique moment and opportunity in Canada for cooperative action to eradicate persistent poverty in our wealthy and wonderful land. It is a time when Canadians of all faiths, from all walks of life, from all parts of this great country are awakening to the unacceptable levels of poverty, inequity and homelessness, and acknowledging that this injustice must change. But we cannot do this in isolation. Committed to doing all we can, we call upon our government to partner with us in ending poverty. We acknowledge with gratitude the many positive government initiatives that continue to benefit the poor. In particular, it is gratifying to acknowledge that a majority of Canadians now live in provinces and territories that have developed and are implementing poverty reduction plans. But it is time for comprehensive, coordinated and collaborative action, with national leadership working in partnership with other jurisdictions. We have taken account of the Senate report, In From the Margins, released in December 2009, and its 78 recommendations, which offers an impressive foundation for action. As faith leaders, we have gathered together in Ottawa days after federal government released its response to the HUMA report. We were deeply encouraged that MPs from all parties worked so well together for three years on this report - studying, consulting, and listening to each other and to constituents. We were disappointed that the federal government response did not take advantage of the consensus for coordinated action reflected in the HUMA report and did not respond substantively to the recommendations. We also gather two weeks before the next federal budget will be introduced. This is an opportunity for the government to begin to act on the recommendations of these studies, as well as to increased public attention to these matters, and highlight spending measures that will allow our country to begin to achieve realistic poverty reduction goals. Faith communities in Canada recognize, across our many different traditions, the unified impulse of all religious practice to nurture and share in community with those who are poor, and stand in solidarity with them. We call upon the government to champion public policies that defend everyone’s rights to dignity and abundant life. Together, we stand, and call on all levels of government to do likewise. We call on all parties and all candidates for public office to make poverty reduction a priority, and all people of faith and good will to raise the issue of poverty with politicians and candidates for office. We call on the federal government to give leadership and develop a federal poverty reduction plan that coordinates federal initiatives with existing and emerging provincial and territorial plans; to enact legislation to ensure federal commitment and accountability to poverty reduction goals; to develop a national housing strategy; and for all levels of government to ensure sufficient investment in social security for all Canadians. As faith communities we commit to launching a national conversation about poverty, to deepen our commitments and multiply our activities that alleviate poverty, and to collaborate with others of good will to address the immediate needs of our neighbours. And we call on all Canadians to consider how each of us, individually, as families, as communities and as a nation manifest in our lives together a common affirmation that all deserve to be treated with dignity and respect; to be part of a community; to experience the reality of home; and to know what it means to have enough and be assured of the basic necessities of life. It’s time for leadership. It’s time to act.